Det kaledonske knuteområdet i Gudbrandsdalen. The outline map fig. 24 demonstrates i. a. the borders of the ectonical-petrographical map fig. 1 (scale 1 : 1/2 mill.) where 6 complete quadrangles and parts of 14 others are represented and may be identified by the coordinate terms. On two, F 30 West (Vinstra) and E 30 East (Sjodalen) the writer carried out the main field work. In the legend to fig. 1 the mountain-building groups I-VI are characterized (translated in Summary). The significance of group V, The Valdres-sparagmite, Caledonian flysch for the interpretation of the tectonics is emphazied. New observations lead the writer to assume the criss-cross tectonics of the junction area being due to pre-existing tectonical lines in the precambrian basement, activised during the Caledonian orogeny by movement, migmatization and intrusions. 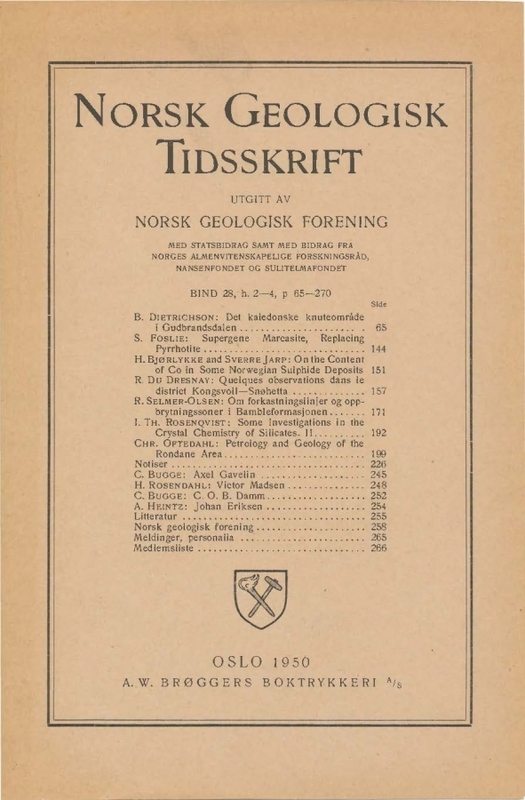 The mapping of Valdres sparagmite in Sjodalen permits conclusions as to thrust-distances of the eruptive-nappes (Ill & VI) of at least 100 km, that is from NW of the Jotunheim-fosse ("Faltungsgraben"). The occurence of microperthites, similar to "Jotun perthites" in Precaledonian and even in, Eocambrian sediments further supports the view that the rock masses of the "dry" Bergen-Jotun-tribe are slices cut out of the precambrian basement near the rim of the continent and the slope towards the main geosyncline in WNW.